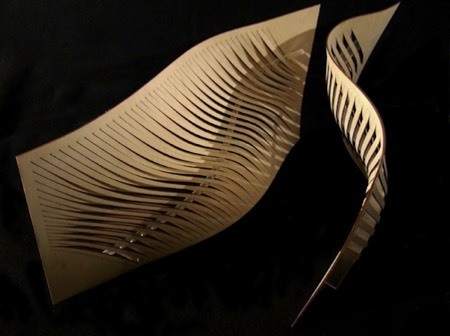 The Digitactility project seeks to explore the relationship of materials and CNC of fabrication. On a fundamental level CNC technology can be viewed as another tactile level of removal much in the same way that as the industrial revolution put into question this relationship. These new technologies have the opportunity to transform the manner in which we manipulate materials and articulate the environment around us. This research takes a material first approach and studies this relationship through a direct and in depth study into material. By a gaining a deep physical and kinesthetic knowlege of (a) materials and a keen understanding of modern digital fabrication techniques new material and spatial effects can be explored and exploited. The introduction of the computer into design and architecture in the late 1970’s and 1980’s began to change the ways that buildings are conceptualized and their documents created. This technological integration has now become prevalent in the fabrication of building componentry through digital fabrication. Digital fabrication as an area of study in architecture is relatively young and yet has become incredibly diverse in its methodologies and application. In the professional environment it seeks to reestablish the architect as an integral component of the construction of a building as they can remotely control and implement the fabrication of individual building components. In the realm of education digital fabrication technology enables for the questioning and conceptualization of complex geometries and the investigation of complex parametric systems that question the monotonous nature of typical architectural construction. While the professional realm deals with this technology in a very real and material way, the field of education is seemingly ephemeral in its interpretation of what digital fabrication can become. My research lies somewhere in between. While it is heavily invested in articulating complex geometries and the possible implementation of parameterized design the core element of investigation is materiality and an investigation of many basic architectural principles. While in the initial stages, as my graduate thesis project, this investigation set out to determine intricacies of material awareness in digital fabrication, a topic that is much overlooked. This relationship is one that is significant because as this type of fabrication becomes more commonplace the users who are actually implementing this technology are becoming more disconnected from the materiality of their designs. Continually manifesting itself in studies that vary from scale to assemblage, the elements of study have evolved and question structural principles, the nature of a plane and efficient methods of joinery, for example. This process has helped to more acutely focus my critical eye, both in my own work and that of others. I feel that this research has only begun and with each iteration new possibilities unfold that will lead in dynamic directions that can further my understanding of architectural space, structures, materiality and architecture.